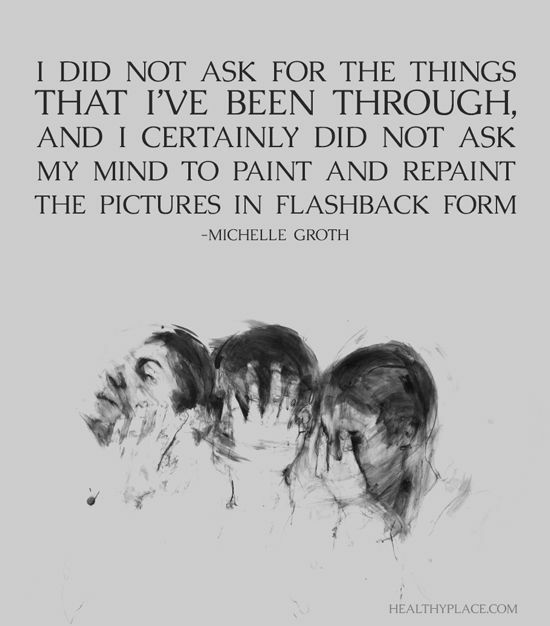 It amazes me the different manifestations that flashbacks can present themselves in. I've come to find that not all of them are earth shattering, and some of them can be as simple as a moment of awareness with barely a ripple. For instance, I've got this HUGE aversion to anything medical, especially if it's going to be invasive ... I. Just. Can't. Go. There. Most of that comes from the complicity of the healthcare community back in the day, long before mandatory reporting came into being. In addition to that, though, I had a flashback the other day as I was pondering what I could do to help me get over this aversion so that I can allow myself to receive proper treatment for a few of my ailments. I was only about 4 years of age and my parental units had left me and my 5 year old sister in the care of our brothers that were 10 years older than us. My dad had served in WWII and had brought back some items from the islands including a grass skirt, ceremonial adornments and a machete. Not sure what all led up to it, but I was accused of swallowing a coin, and the next thing I knew I was being held down on the coffee table by the older siblings as they wielded the machete over me and threatened to cut me open to remove the coin. This was just another source of humor and entertainment to them, but I remember being totally terrified because they wouldn't listen to nor believe me as I cried and screamed for help while begging them to not cut me open because I hadn't eaten the coin. Of course they eventually let me up while laughing at the tear streaked & terrified "baby" they'd just tormented to hell. So, after having this ripple of a flashback, I felt so sorry for the helpless little kid I was, and also a bit angry that what was a moment of laughter and fun to them was causing me so much emotional harm and how none of those SOB's gave one flying eff about that. There were so many of these moments while I was growing up, and along with all the physical, emotional and sexual abuse I was being subjected to inside that little house of horrors I grew up in, it makes me wonder how I can even function at all after living in all of that for 33.5 years. Of course, The Body Keeps The Score (Bessel Van der Kolk, MD), is spot on as my physical health is suffering greatly because of all the mental health issues I developed because of the abusive, toxic and violent environment I grew up in. I'm almost 60 years old now and my body is going south on me so fast that it makes me worry where I'll be in the next 10 years. All I know is I will never be in a position of defenselessness with another human being having total power and control over me. Last edited by Pfrog; 10-21-2018 at 03:18 PM. Reason: Found A Typo! Pfrog, im really sorry.. abuse can never be undone. I hope you feel better and live a long life. I appreciate all the hugs & responses. It really is good to feel listened to, understood and supported! I spoke with my family doctor about having PTSD. And although he isnt trained in this field he agrees 100% I do suffer from this. I have horrible flashbacks , some so dark I need a light on to sleep. I also have a few good ones, it mostly involves smell , texture and sounds. I'm sorry you have to experience the bad ones too, Borderline69 ... I find the ones I get while sleeping to be so disturbing and disruptive ... I wake up totally freaked out and it takes me some time to realize that it was a flashback while dreaming (often involves nightmares and night terrors) and I have to really do a lot of soothing self-talk to reassure me and my inner child that the bad stuff is not happening to us all over again right now ... Really don't like those ones at all ... And, I, too, also have some interesting olfactory (smell) flashbacks and find most of them related to "good" memories instead of bad ones ... Those ones are okay. Then there are the things that happen in everyday life that bring back memories (not sure if they're flashbacks or not), but often these are not good memories ... For instance, I've recently realized why I have such an aversion to doing anything in the kitchen ... So much trauma occurred there when I was growing up which makes it extremely difficult to "enjoy" the processes of preparing a meal because too much bad stuff keeps coming up and it's just too much for me to deal with that on its own, much less while trying to remain focused on preparing a meal.